MANILA, Philippines — The� Bureau of Customs� will now require the conduct of post-clearance audit on importers and brokers, as well as the prior disclosure in their goods declarations in a bid to further improve its revenue collection capabilities. Customs commissioner� Rey Leonardo Guerrero� issued Customs Administrative Order 01-2019, dated Nov. 29, 2018, prescribing the policies and guidelines on the conduct of post-clearance audit and the establishment of a non-punitive facility where importers can voluntarily disclose or report any errors related to their goods declaration. “These measures are geared toward ensuring that the lawful duties and taxes are collected with least administrative cost to importers and the government through an informed compliance regime,” the BOC said in a statement. Under the new rules, the post-clearance audit (PCA) covers the profiling or information analysis on importers, customs brokers and other stakeholders of the BOC, which includes data gathering and evaluation of import and export operations as a means to measure and improve compliance of stakeholders. It is conducted after the release of the goods from Customs control to verify the accuracy and authenticity of declarations and other returns declared before the� Bureau of Customs. During the conduct of a PCA, importers are mandated to give the BOC full and free access to their records. “This is in consonance with the power of the Commissioner of Customs to obtain information from any person or from any office of the government and summon the person liable to produce the needed information pursuant to the Customs Modernization and Tariff Act,” the BOC said. Furthermore, Guerrero also ordered the implementation of the Prior Disclosure Program (PDP) and the establishment of a non-punitive facility through which importers may disclose any errors in goods declaration. PDP is a program based on international best customs practice, which allows the Customs Commissioner to accept prior disclosure on errors and omissions in importers’ goods declarations that resulted in the deficiency in duties and taxes of past importations. When availing of the program, the importer must state the errors in goods declaration and state their intent to pay the deficiencies in duties, taxes, and penalties. This program is also available for importers who have already received an audit notification letter (ANL), provided such intent is made within 90 calendar days from the receipt of the ANL. However, goods declarations which are the subject of pending cases with any other Customs office or in courts, as well as those where fraud is involved, are not qualified to apply for the PDP. The BOC said importers intending to avail of the PDP would have to pay the deficiency in duties and taxes due with or without penalty and interest ranging from 10 percent to 20 percent, depending on the application status of the subject entity. 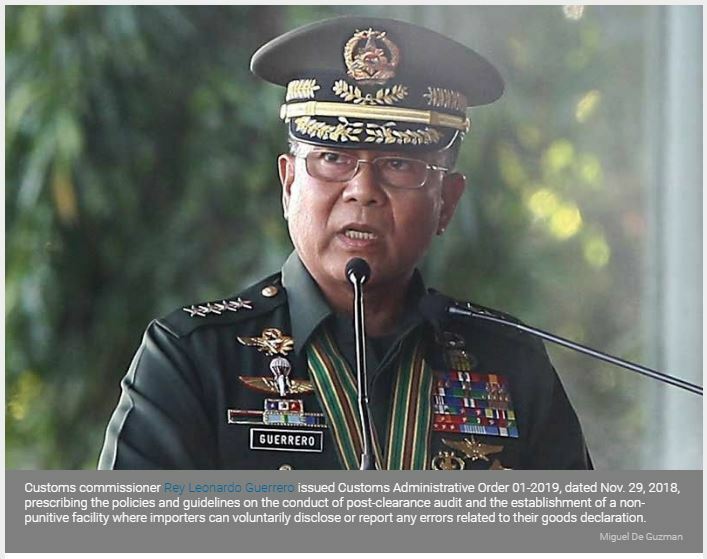 According to the agency, the conduct of PCA and PDP will be under the Post Clearance Audit Group (PCAG), currently headed by assistant commissioner Vincent Philip Maronilla.